Rocky Mountaineer, the luxury tourist train operating in Western Canada and the Pacific Northwest, is a unique way to see all this part of the world has to offer. The train takes you on a journey alongside rivers, through quaint mountain towns, and within arms-reach of stunning, snowcapped mountains. The experience onboard the all-dome fleet features rich, historic storytelling, world-class cuisine, and a first-hand look at lush green forests and turquoise glacier-fed lakes, all from the comfort of reclining plush seats. With four unique routes to choose from, the unforgettable all-daylight journeys offer romance and history, reminding you that traveling is as much about the journey as it is about the destination. 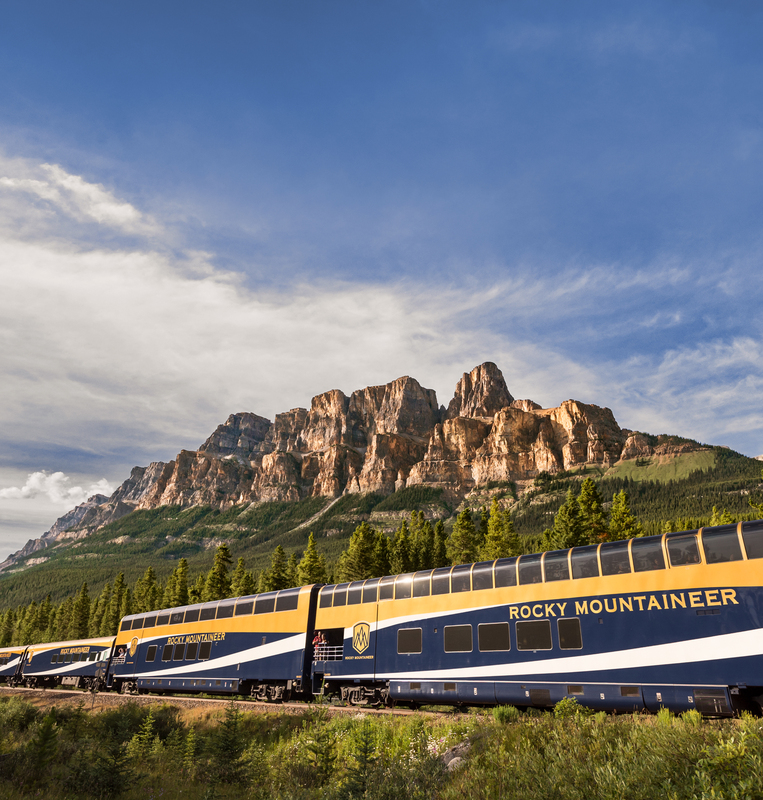 The moment you arrive at the station, Rocky Mountaineer’s exuberant team is there to celebrate with you. From the bagpiper regally playing you onto the train, to the fresh scones served straight from the oven, a literal red carpet is rolled out to welcome you. 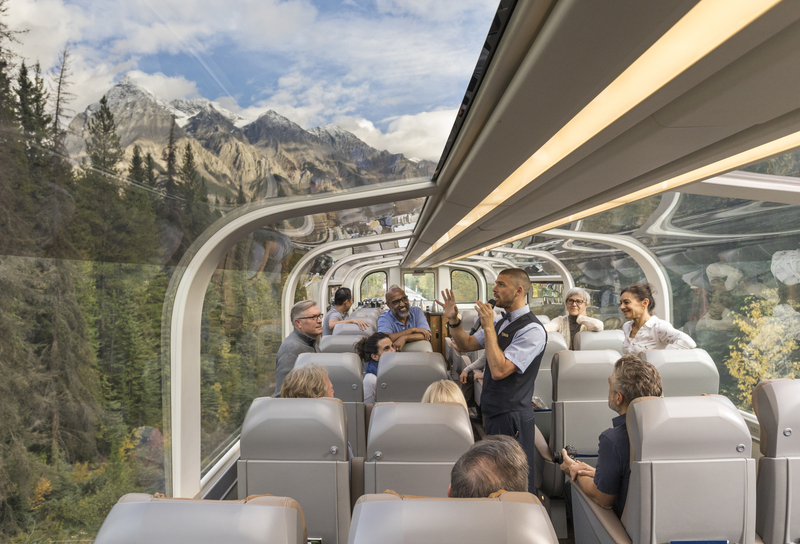 As the train pulls out of the station, the onboard Hosts are eager to start the journey with a morning toast and share stories of the history, nature and excitement that surrounds the train throughout the day. There’s an immediate comradery that is almost palpable from the onboard Hosts and your fellow travelers as you embark on your journey together. Rocky Mountaineer offers two levels of service, both with the compelling hosts, delectable food, and all the comforts Rocky Mountaineer is known for. Stepping onto the bi-level, glass-domed train cars of GoldLeaf Service is a luxurious experience unto itself. With sprawling windows on the upper level, you can feast your eyes on sights at every. Downstairs, an elegant dining room awaits, where you have the opportunity to sit with other travelers and enjoy a freshly prepared breakfast and three-course lunch as you discuss the dramatic scenery passing outside the windows. SilverLeaf Service offers optimal viewing from oversized picture windows, so you don’t miss a moment of the stunning waterfalls or eagles soaring overhead. With a selection of locally inspired menu options served right at your seat, you receive the royal treatment while chugging along the railway to the various destinations. British Columbia’s Okanagan Valley, local Canadian beers, and high-end spirits to round out the culinary delights. The stunning scenery with endless views are enough to keep you enthralled, but beyond that, there’s the chance to make new friends and connect with your traveling companions as you take in this memorable trip of a lifetime.